The Intergovernmental Panel on Climate Change (IPCC) is about to release its synthesis report, the last installment in a series of reports under the Fifth Assessment Report (AR 5) cycle, on November 2 following week-long negotiations in Copenhagen. AR5 consists of three working groups and a synthesis report. The synthesis report that is to be released on Sunday will integrate the findings of the three working groups. The final synthesis report aims to decode scientific evidence into a concise lingua franca for the policy makers. These reports provide a sound scientific rationale for governments to take strong future political decisions on climate change. It also serves as a citizens’ guide to engage their leaders to enact and implement policies on climate change. During the week, experts will review the draft report before releasing the final version on Sunday. The authors of this latest synthesis report have strived to use more incisive language with a clearer indication as to the impacts should the policy makers fail to take action. This marks a shift from the diluted verbiage of the last assessment reports. The meetings held to finalise the draft synthesis report are generally held in a more informal atmosphere as compared to the contentious political negotiations. Although the content will be reviewed, the aim is not to modify the contents of the report but to simply cull out scientific evidence critical to climate negotiations. To ensure that every country is working on the same scientific basis, the process involves approvals from governments. But, despite of the unpretentious nature of this meeting, there are concerns of the role that the governments are set to play in this meeting. BBC has reported of efforts to steer science in a certain direction to reflect popular negotiating stances. However, the IPCC chair, Rajendra Pachauri, intervened and reminded the delegates that this is meant to be a summary for the policy makers and not by them. The latest report is released countries prepare to enter the final stages of working towards an international climate deal. "It is the last word that science will have in this process," says Alden Meyer from the Union of Concerned Scientists, who is attending the Copenhagen meeting as an observer. This laborious undertaking was a result of work done by 831 authors, 1,200 contributors, 3,700 expert reviews and by drawing on more than 30,000 pieces of research and 143,000 expert comments. The IPCC, established in 1988 by the World Meteorological Organisation (WMO) and the United Nations Environment Programme (UNEP), has acted as an interface between climate science and policymakers. It is the main global scientific guide consistently referred to by governments in designing policies and taking action to prevent global warming. 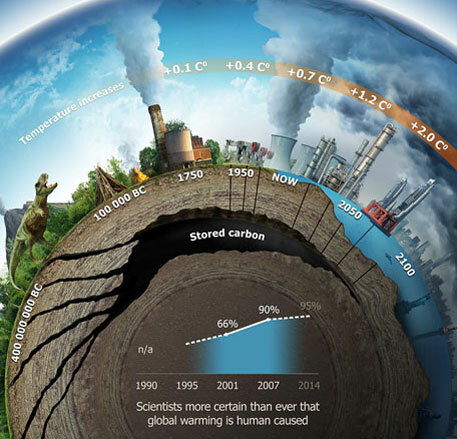 IPCC’s previous reports released in 1990, 1995, 2001 and 2007, enabled the world governments to implement measures for the adaptation and mitigation of climate change.